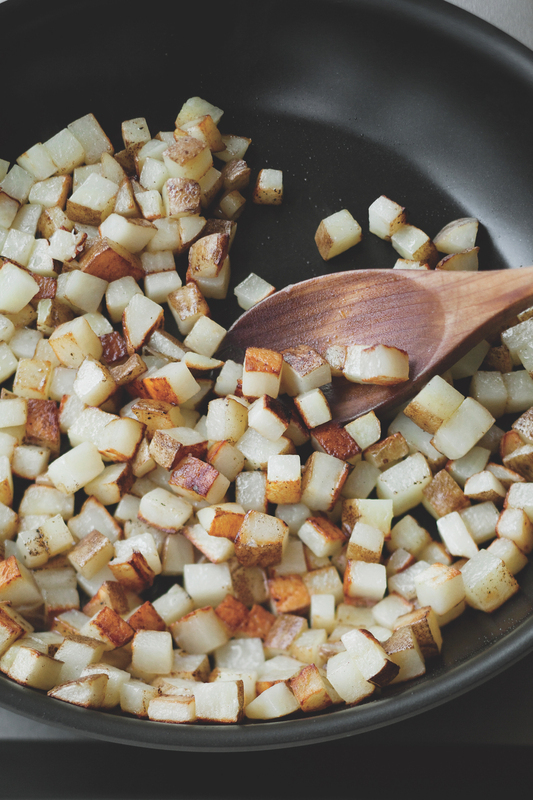 Funny how many people think hash is leftover meat and potatoes when you don't actually need either to make a fantastic hash. 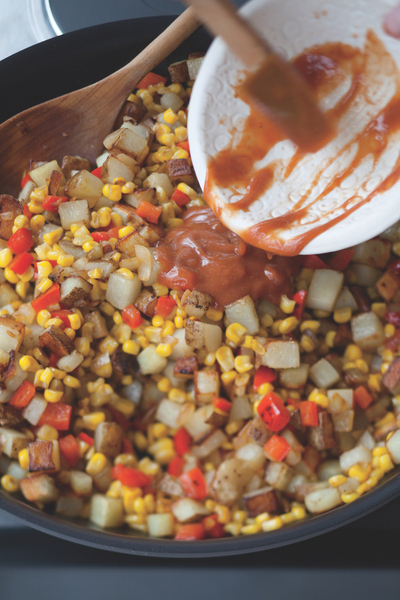 Better still, it's possible to make great meatless hash--from start to finish, no leftovers required--in less than 30 minutes. The good news is that hash can be prepped ahead. It's also possible to almost completely cook the hash a couple of hours ahead. Store the cooked vegetable mixture in a bowl and spread the cooked potatoes on a large baking sheet, covering them with plastic wrap once they've cooled. About 10 minutes before you plan to serve, heat up the skillet, add the potatoes to re-crisp them, stir in the vegetable mixture and flavorings, and it's ready 5 minutes later. Hash should be eaten hot off the stove. I've been known to warm up leftovers for lunch, but it's nothing I'd serve to company. Any of these hashes can be topped with a fried or poached egg or a dollop of light sour cream. A mix of purple, Yukon Gold, and russets makes an especially attractive hash. Posted by Rodale • Published 27th March 2013 • See Rodale's 4 projects » © 2019 Pam Anderson / Rodale · Reproduced with permission. Heat 2 tablespoons of the oil in a 12-inch nonstick skillet over low heat. Meanwhile, cut up the Vegetable and onion (or onion and bell pepper). Two minutes or so before cooking, increase the heat to medium-high. When the oil starts to send up wisps of smoke, add the vegetable and cook, stirring occasionally, until golden, 5 to 7 minutes, depending on vegetable's moisture level. Add the onion (and pepper, if using), season lightly with salt and black pepper, and cook until the onion softens, about 5 minutes. 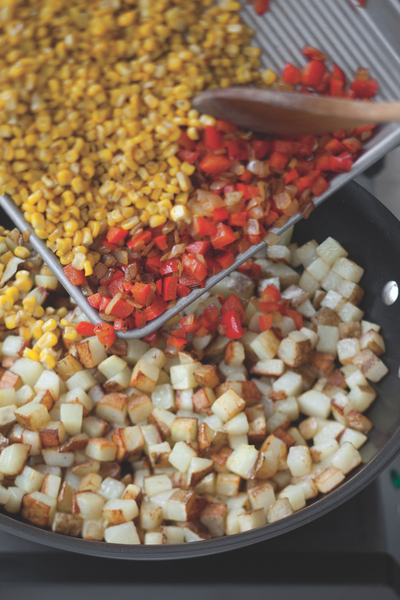 While the vegetables cook, dice the potatoes and toss with the remaining 2 tablespoons oil. Transfer the cooked vegetables to a baking sheet and set aside. Add the potatoes to the empty skillet and cook, stirring only occasionally so that they form a golden brown crust, about 10 minutes. Meanwhile, mix the ketchup, mustard, 2 tablespoons of water, the Dried Herb/Spice (if using), and/or Fresh Herb (if using) in a cup. Return the cooked vegetables to the skillet and stir in the ketchup mixture. Cook, stirring frequently, until the flavors meld and the hash has browned nicely, about 5 minutes.